Have you ever wanted to pack up your family and move to a different country? 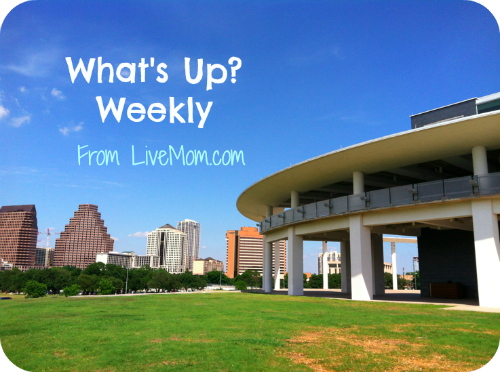 That’s just what Cheris Lifford, an Austin mom of two, did last year. While it sounds dreamy escape from routine, it’s also a whole lot of work to not only adjust to a new way of life in a foreign country but to also make arrangements for all of your business to be settled while you’re gone. Read part one of the Lifford Family’s Adventures in Spain here to see how the family adjusted to moving from Austin to Spain. 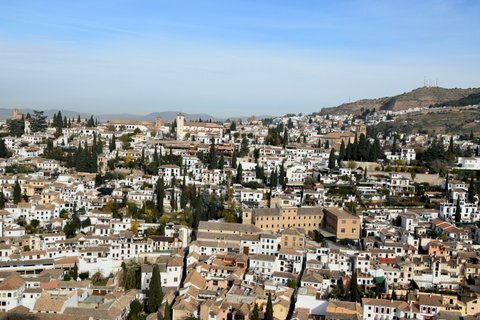 Now that the family is settled, is life really like a vacation every day in beautiful Granada, Spain? 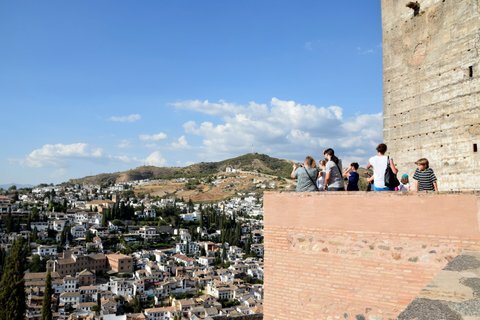 For kids, Granada, Spain can be paradise: a castle on a hill; an ancient labyrinthine neighborhood to explore; chocolate, pastries and ice cream on every corner; piles of bread and fries at every restaurant; horses, Vespas and Segways to dodge; and the ability, no, the imperative, to stay up late. It truly is possible to have fantastic family vacation here. But we’re not on vacation. The main attraction here is the Alhambra. 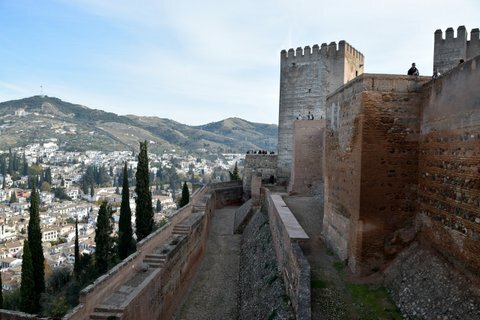 This castle overlooking the city was the last Moorish stronghold in Spain. It’s beautiful, with a fascinating, tragic and complex history. Without kids, you could spend all day there. With kids? 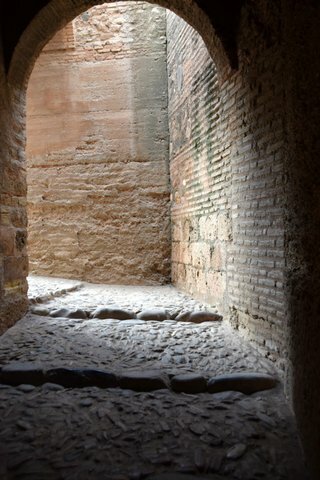 Well, they’ll love the Alhambra too, but they will not stop to listen to the audio guide. They’ll want to explore the gardens, watch the fountains, imagine themselves as sultans, spin under the vaulted ceilings, and race to the tops of towers. (Tip: read about the architecture and history it before the excursion, then let the kids lead the way, sneaking in a bit of trivia when they’re captivated by something.) There is space enough to wander without feeling herded, so, tranquilo and enjoy. The windows and turrets of the Alhambra offer an incredible view of my neighborhood: the Albayzin. This was the original Granada. From the Arabic empire, to the Catholic conquest, to the Inquisition, to Napoleonic bombings, to the Spanish civil war, the Albayzin has played a part in it all. You can feel the history as you wander the tiny alleys and streets. This is your chance to tell your kids to get lost. Really. Set aside a morning or afternoon and give them complete control. Right or left? Up the crooked stairs or down the shadowy street? 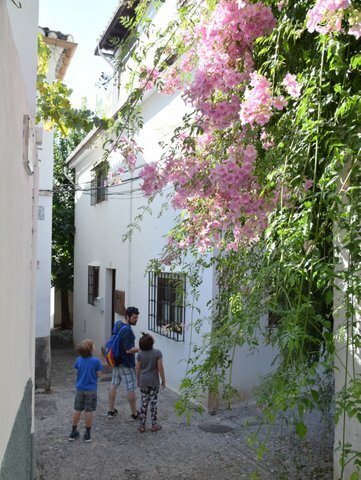 Ask them to find hidden gardens, mysterious doorways, dead-ends, or the sound of flamenco music. Spanish-style gelato or pastries could be waiting around any corner. Just remember to look down as well as up. 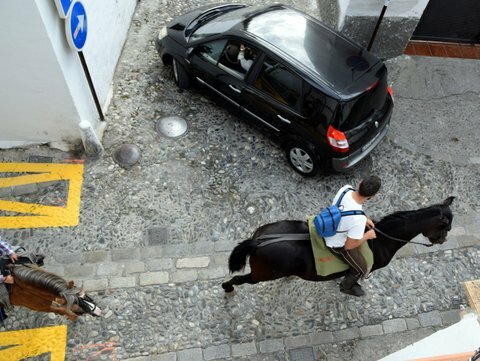 Broken cobblestones and dog-doo are all part of the adventure. Around 2pm, find a restaurant on a plaza for the biggest meal of the day and let the kids run amok with the other children while you sip excellent house wine and enjoy a free tapa with each round. Or order a menú del día: three courses (appetizer, main, dessert) with several choices for each. Just be warned: eating out in Spain will always take twice as long as you think it will. (Tip: come prepared with a book or drawing supplies for the kids. If you know a meltdown is eminent, don’t attempt to “run out for a quick bite”. ) In Spain, you are forced to relax, savor your food and enjoy the people you are with. DO NOT look at your phone. A long siesta makes it possible to take the older kids to see flamenco. Some shows may start as early as 7:30, but most are at 9 or later. Many venues offer dinner as well. However, I recommend the cave shows. The history of this art form is tied to the old cave homes dug into this hill we’re living on. (In fact, part of our own house is a cave.) Granada was a melting pot for centuries, and you can hear the Arabic, Romani, Jewish, and Spanish influences in the music. 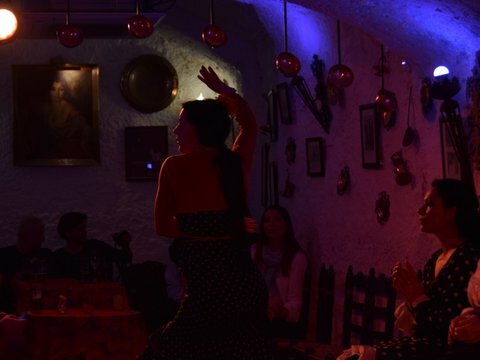 The cave houses in the Sacromonte neighborhood down the street from us were a mecca for flamenco from its early days. It’s now home to a variety of small venues where you are truly face-to-face with the performers. The shows are intense, and I think even the most jaded teen or wiggly grade-schooler will be fascinated. Before you leave town, wander the Arabic bazaars and stop for tea and crepes in one of the many Moroccan teterias. (You may have to explain hookahs to the kids.) 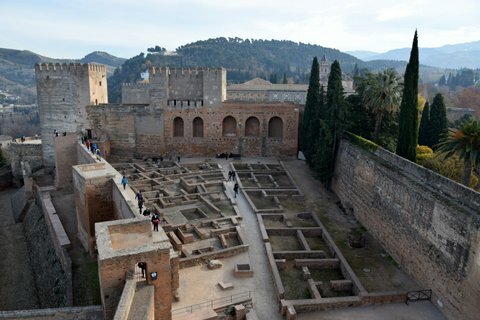 If you have time, you could visit the cathedral and tombs of Isabella and Ferdinand, who conquered and “united” Spain before sending Columbus on his way. Or just head out of town to the nearby beaches. But what happens when you live in a tourist town? Well, you certainly don’t visit the sites every day. And you don’t eat out constantly. Or stay up late every night. Or take tours. Or wander leisurely. I’ll admit it’s hard to rush through the plaza on a sunny afternoon and see the crowds chatting and eating and sipping beverages while I have to pick up the kids or go grocery shopping. Incredibly, I can get so caught up in our daily lives and chores and tasks that I forget where we are. It’s shocking how quickly you can become accustomed to your surroundings or your circumstances and lose all perspective. Ridiculous? Yes. Human nature? Sure. I have to make a conscious effort to focus, really focus,on all the amazing things in front of me. So at the halfway point of our year abroad, we’re feeling a bit panicked and redoubling our efforts to stay in the moment. No, we don’t tour the Granada tourist spots every weekend. But we can hike the trails around the town to see it in a whole new way. Or take day trips to nearby pueblos, the mountains, or the beaches. We can’t eat out every day, but we can discover new ingredients and learn to cook new dishes. Or find the spots that the townies love. We don’t go to flamenco shows constantly, but we can check out local bands, or watch fútbol with the neighbors at the pub. And although it’s sometimes extremely frustrating and difficult with our very limited Spanish, we can meet new people. It all takes effort. It’s tiring. But the clock is ticking. Cómo se dice “I should apply this attitude to life back home” en español? About the author: Cheris Lifford has lived in the northwest, the northeast, and the Far East, but moved to Austin in 2001. Currently she and her family are spending a year in Granada, Spain. She is blogging about the experience at: www.yAhoraQue.org. All images courtesy of Cheris Lifford. huésped blogging otra vez | ¿Y Ahora Que?